Inflation has been pretty benign over the last 20 years, right? The U.S. Consumer Price Index has ranged from negative 0.4% in 2009 to a high of 3.8% in the awful 2008 economic year. In 13 of those 20 years, the CPI was below 2.5%, which is hardly comparable to the double-digit inflation rates that people experienced in the 1970s and 1980s. But not all expenses moved in lockstep, as you can see from the accompanying chart. Since 1997, college tuition fees have risen almost 170% on average, while the cost of a television set has fallen by more than 80%. 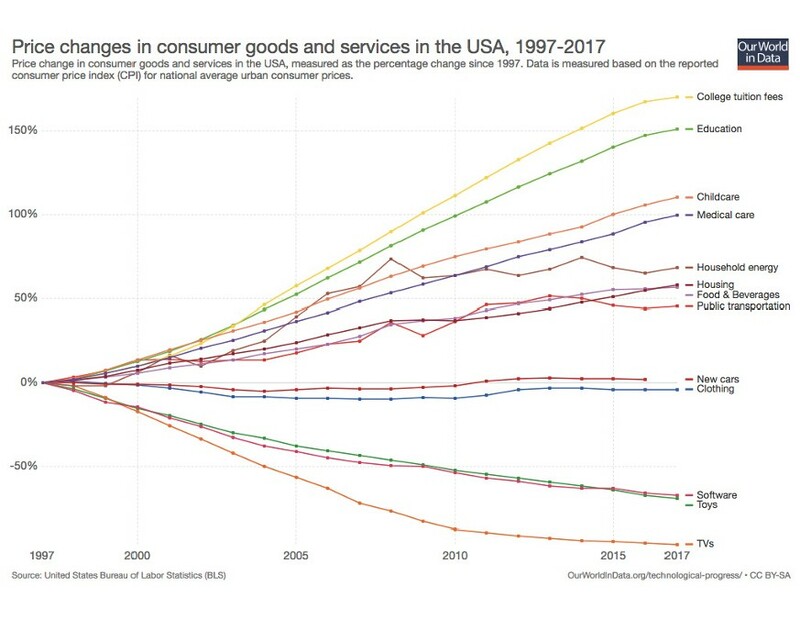 Software and children’s toys have become dramatically less expensive, new cars and clothing have largely escaped inflationary price rises, while nearly everything else has become dramatically more expensive. Childcare and medical care have risen by approximately 100% in cost over the last 20 years, and energy, housing costs, food, beverages and public transportation all cost 50% more than they did 20 years ago. The lesson here is that your own inflation rate depends on what you’re buying. If you’re sending kids to college (or paying for college on your own), and/or if you require a lot of medical care, then chances are your personal expenses are rising much faster than the inflation rate. If you’re mostly spending your money on toys and TV sets, then you’re largely escaping the bite of inflation.